With the warmer weather on its way, we start to look at how garden design in 2018 is shaping up and how you can bring these garden trends into your own outdoor space. Gone are the days when every stone and piece of wood or plant needed to be placed perfectly in line and in balance. Now, it’s all about creating a beautifully imbalanced look, and breaking down the harsh lines with softer plant beds. There’s no longer a need for the central feature or strict zones that we’ve previously seen in garden landscaping. Instead, let the whole garden flow naturally and don’t be afraid to move things around and change the balance. From the smoothness of limestone to the jagged lines of slate, this year is all about bringing interesting textures to your garden. Slate or rough stone paving, natural bark planters and limestone blocks are just some of the many ways both landscape designers and homeowners are incorporating texture into their garden design. Whether it’s a naturally weathered effect or the more contemporary metallic copper that you prefer, copper can be incorporated into your garden in a range of ways. You could even experiment with adding the colour in less obvious ways, through the tones of wood you use in your garden or the flowers that you plant. Even the unpredictable British weather can’t keep us inside! 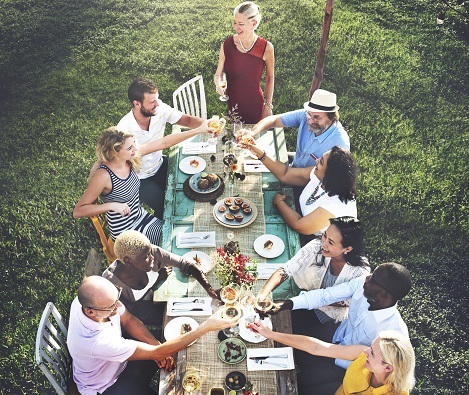 Entertaining guests outdoors has grown in popularity over the last few years, with more outdoor furniture and accessories being sold than ever before. Barbeques and pizza ovens are the new summer chef’s tools of choice, hot tubs and firepits have become the norm for most households and the garden furniture is no longer just something you drag out of the shed when it’s warm; it’s become a vital feature of garden design. As outdoor living grows in popularity, so does the need for lighting that can keep those summer nights lasting longer. The solar lighting market has come on significantly, with a range of designs to compliment every garden and suit every purpose. From subtle string lights to spotlights and wall lights, you can create a beautiful atmosphere in your garden and keep enjoying the outdoors long after the sun sets. Your garden is a space for you to relax and unwind, whether alone or with friends and family. Bringing mindfulness into your garden through sensory stimulation will aid the calming atmosphere. Sounds such as wind-chimes and running water from water features promote calm, and the strong scent of the lavender plant can relax the body and mind.